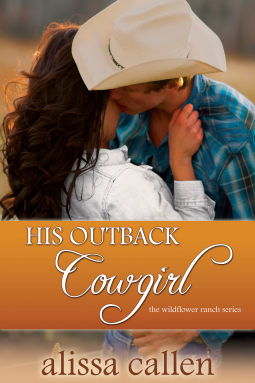 His Outback Cowgirl – Want More!!!!! Alissa Callen’s Wildflower Ranch Series has become one of my favorites in recent times, and I’m so in love with these cowboys and cowgirls as well as Alissa Callen. Each book in the series is a charming love story under the big skies of Montana, people with big hearts, warm relationships and immense support and love. And into this heartwarming land comes “His Outback Cowgirl” Bridie Willis, Zane’s stepsister. Filled with grief over her father’s death and having no home in the outback anymore, Bridie is at a crossroad in her life. Spending time with her recently found family, all she wants to do is hone her love for photography and put a closure to her grief. Life has dealt Ethan Morgan a few hard blows that had molded him into what he is today, a warm and caring man, open with his love, and his unconditional support for his family. Seeing Bridie stirs feelings that have been buried, yet he feels inadequate for her. Ethan is one of Alissa Callen’s perfect heroes, humble with his imperfections. I loved him for the way he’s tuned into Bridie’s sadness, her desires and her insecurities. I just loved him!!!! Too short for my satisfaction and yet leaving me with so much happiness and tingles 😉 “His Outback Cowgirl” is another feather in Alissa Callen’s series. There’s no dearth of sentiments and emotions, and you can’t help but fall in love with Ethan and Bridie. Now all Bridie has to do is trust her heart with Ethan and Ethan needs to trust his feelings for Bridie. « Mistaken Identity – Can It Build Trust?